Arrange the sandwich by first cutting the focaccia in half, horizontally, into two separate pieces. Ensure that each piece is 1 cm thick. Trim away any excess bread from the center to achieve this. Use the trimmed bread for another use. You should now have two pieces of focaccia that are of the same size and thickness. One piece from the top of the focaccia, and one from the bottom. Lay each piece with the outsides edges facing down. Evenly spread 100 g of the Dilmah Blueberry and Pomegranate emulsion on slice. Repeat with the other. Spread the shredded pork belly onto one slice in and even layer, being sure to spread all the way to the edges. Invert the other slice of bread onto the shredded pork mixture. Ensure that the edges of the bread align well. Cover with plastic film and place in the center of a shallow insert. Place another insert on top of the sandwich and place a 1 kg weight on top to provide pressure. Ensure that the inserts and the weight is centered, and that the sandwich is evenly pressed down. Place in the refrigerator to allow to fully chill and set. When set, remove the plastic film and cut pieces that are 2 cm x 4 cm. Finish the dish by placing the sandwich on top of the trimmed bamboo leaf in a suitable serving dish. 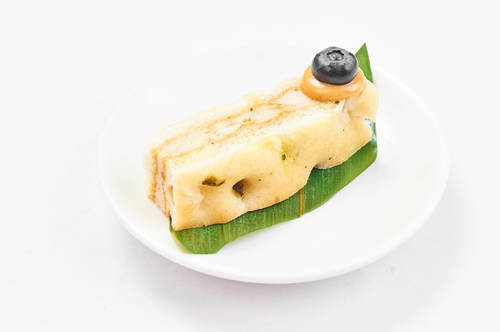 Garnish by piping a small amount of Dilmah Blueberry and Pomegranate tea emulsion on top of the sandwich and placing a blueberry on top of the emulsion. Transfer the contents to a squeeze bottle and reserve for use later.